The Instant Pot Ultra 6 Qt 10-in-1 Electric Pressure Cooker is one of the latest addition to the Instant Pot family. and is one of the most feature-packed & customizable electric pressure cooker that the market has ever seen!! 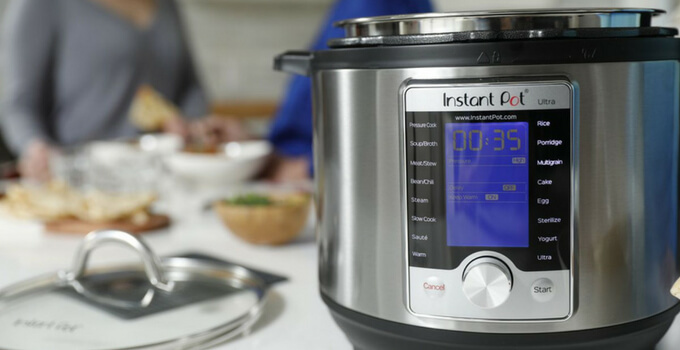 A sleek & geeky addition to the Instant Pot family. having the power of 10 different appliances in just one powerful machine. The Instant Pot’s latest model, ULTRA, not only re-designs the way you can use a pressure cooker – but it puts the power of creating a nearly unlimited number of programs right in your hands. *You can click on the links to jump to a specific section. Should I buy the Instant Pot Ultra 6 Qt 10-in-1? The amazing new feature that comes with this mode is the “Ultra” function that will give you the ability to pre-program the cooker with different cooking times, and different temperatures, and also you can choose between two types of pressure. The uses for this granular control are not so clear until you start to use it and realized that is not only 10 appliances in one, is more like thousand of tools in one. You are going to realized that beside the regular features that come along: pressure cooking, sauteeing, slow cooking, rice cooking, yogurt making, steaming, sterilizing and keeping warm the Ultra feature will let you set the right temperature to, for example, scald milk (180°F/82°C) and melt chocolate (104°F/40°C). But here is the tricky part! You could get confused with the hipe of the Ultra function you need to understand that the cooker can’t cook at any pressure and any temperature. Unfortunately the Ultra function, as well all the other functions with a “pressure” option, only allow you to pick between “high” or “low” pressure. The Ultra function will allow you to pressure cook from 0 minutes up to 6 hours only using pressure; or, using a custom non-pressure temperature (104 to 208°F) from 0 minutes to 99.5 hours. Thr only way around is that in case you want to pressure cook any food for more than 6 hours you can use the post-cook “Keep Warm” mode that will continue to cook the food for up to 24 additional hours. It won’t pressure cook but it will extend the cooking time overall (think Bone Broth, for example). With the previous Instant Pot Models you need to turn the Venting Knob to Sealing Position to seal the Instant Pot; then turn the Venting Knob from Sealing Position to Venting Position to release the steam. So the New Ultra model by using the new Steam Release Valve will now seal automatically when you close & secure the lid on the Instant Pot (Quick Release button up = sealed). You can also slightly turn the Quick Release button counter-clockwise until it pops up to seal the Steam Release Valve. 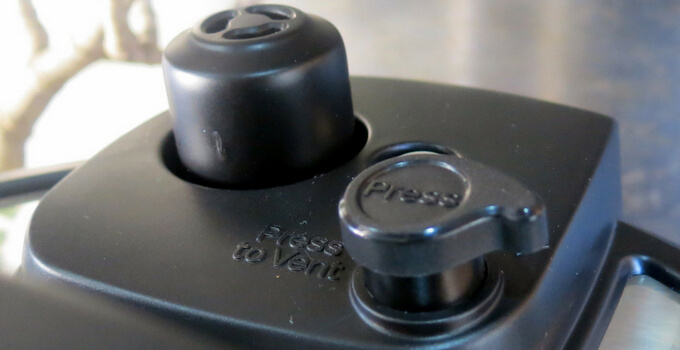 To release pressure or to perform a Quick Release, you just need to press down the Quick Release button until you hear the click and the cooker will lock into Venting position. If you press all the way down you will get a full blast steam release or if you only press it down slightly you can release just a little pressure. The steam release control is one advanced feature without a doubt. If you normally forget to turn the Venting Knob to the Sealing position, this feature is a fantastic addition. You need to have in mind that in case you try to close the lid while the liquid on the Instant Pot is boiling, you may have to press down the Quick Release button for it to close. This locking mechanism is activated due to the machine’s safety feature. So in case you want to use the Saute function you need to scroll through the program list with the dial button to select the Saute program. And if then you would like to use the Pressure Cook program, you will need to press the Cancel button, then scroll through the program list and found the Pressure Cook program with the dial button. So now it will take extra steps to select and adjust from one program to another. So it’s a little annoying, but we hope that the next version will address this issue. For us, the Ultra model could be better with Pushable program buttons and +, – buttons. A cool addition though is the New Progress Indicator that now shows a lot more information with a graph that indicates what stage the pressure cooker is in. 10 in 1 Multi-cooker – Pressure cooker, slow cooker, saute/searing, rice/porridge cooker, cake maker, yogurt maker, egg cooker, steamer, warmer, and sterilizer. Dial Interface – Move around all the settings by spinning the dial and pushing it to select them. Custom Programming – For most features and programs you can select pressure/temp, whether to delay cooking and for how long, and weather keep-warm should kick-in once the cooking is done. Cooking progress indicator – Easy to understand display that shows you the cooking states and progress: Preheat, Cooking and Keep Warm. Settings “Memory” – The machine will remember all the settings that you have used before, including time, pressure/temperature. Self-closing weighted valve– Automatically reset to the ‘sealing’ position for pressure cooking when you open or close the lid. Sound Off – You can turn off all button-press and alert beeps. Altitude adjustment –By the power of the fuzzy logic you can adjust pre-programmed times and to ensure the cooker does not time-out before cooking at high altitudes can commence. Dual Sensors – Contains both temperature and pressure sensors for more accurate readings. 2 Pressure settings – For full-power or delicate pressure cooking. 3 Slow cooker settings + custom temp– For versatility, choose to slow cook at low, medium high or a custom-set temperature. 3 Saute’ settings + custom temp– For versatility, pick to slow cook at low, medium high or a custom-set temperature. Lid-Holding Handles – There’s no need to figure out where to put a hot steamy lid. Just stick it in the handle, lefty-compatible. 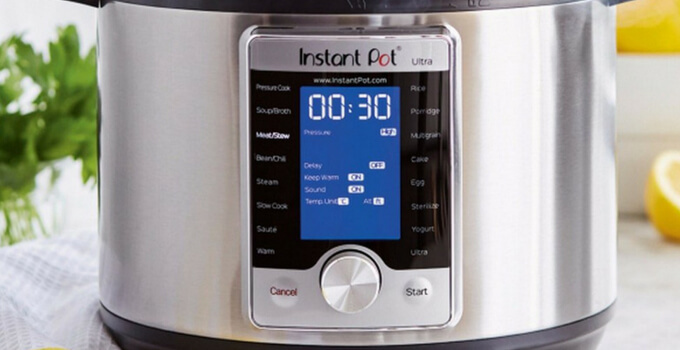 Just like all the Instant pot models, all the programs are just pre-set cooking times and pressures recommended by Instant Pot for cooking those particular foods. All these programs can be adjusted manually with all the options offered in the Pressure Cook program. Something that is not available on this model is the “less” and “more” recommended times. This function has the ability to steam your meals at high, low or no pressure at all going for 0 minutes up to 4 hours. The no pressure option is a cool addition that will help you when you need to steam veggies. But in case that you would like to pressure cook your veggies since is fastest you can set the cooking time of this program to “0:00” using “low pressure” which means that the cooker will reach pressure and beep so you can liberate the veggies from the high heat quickly! 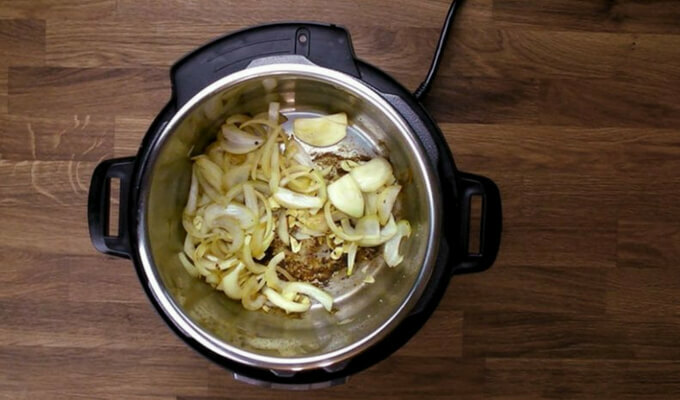 Some people have complained about under-cooked food and less evaporation when slow cooking with all Instant Pot models, and this one is not the exception. This problem comes as a side-effect of all the new generation thermostat-regulated slow cookers against the old school wattage-regulated cookers as well the uneven heat distribution between a stainless steel insert compared to the ceramic inserts. If you would like to get similar results of the one that you will get with a traditional slow cooker, bring the contents of the cooker to a boil using the saute mode before closing and after that set the pressure valve in “seal” mode to get a more evenly distribute heat inside the cooker. If you can get your self an extra aluminum ceramic-lined inner pot to more closely replicate the vertical heat distribution of a traditional Slow Cooker. The stainless steel insert that comes along it only has a disk of aluminum on the base and does not distribute heat evenly up the sides of the pot. The saute’ function can only be set to cook between 1 up to 30 minutes and you can use Low (275 -302°F or 135 -150°C ); Medium (320 -349°F or 160 -176°C) ; or High (347-410°F or 175 – 210°C) temperatures. In case you would like to sear meat on the Instant Pot it’s important to know that all models require the cook to increase the Saute’ temperature above the default settings. However, adjusting the saute’ mode on the ULTRA is not as easy as it should because of the new turn-dial interface. The other Instant Pot’s models you need only to click the “Saute’” button and then the “Adjust” button (two taps) and you are good to go, the only one that has a difference is the DUO Plus version that just needs the “Saute” button punched twice but lets say that is pretty easy as well. But with the new ULTRA model getting to the highest pre-set temperature you will need to twist to the “Saute’” function, tap in there, twist to the temperature setting, tap to choose it, twist to “High”, tap to select it, and press start. The warm mode comes to replace the “Keep Warm/Cancel” setting that is on the other Instant pot models warming at Low (185°F/85°C), Medium (194°F/90°C), High (208°F/98°C), and Custom (104-194°F/40-90°C). There a small problem here with the custom setting of this program, since you cant programmed the cooker to a high enough temperature range as the pre-set. The Sterlize mode can be set to be used up to 4 hours and you can choose between no pressure, low pressure or high pressure. The product listing on IP website claims that this can be used for certain kinds of canning and gives a reference to USDA’s guide for home canning. But have in mind that this model has not been tested by USDA for food safety in pressure canning. Med: boiling-water canning at for acid fruits, tomatoes, pickles and jellied products, etc. High: at high pressure, steaming baby bottles, utensils, etc. 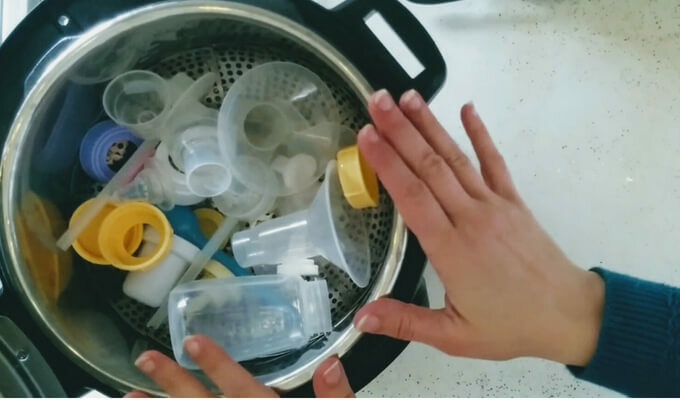 So using the Sterilize mode is tricky we would recommend you to use it for sterilizing utensils only. This funciont is one the most be loved bnetween IP users and is also along with the ULTRA model , incliudes the same 3 settings including Low (91°F/33°C) for fermentation, Medium (107°F/42°C) for yogurt incubation, High (181°F/83°C) for bringing milk to a boil, they also add a Custom Program (104-176°F/40-80°C) but this last one is not perfect since the lowest you can use this setting is 104°F and is not as low as the cooker can actually go using the fermentation setting (91°F). Anti-Blockage Vent – This one prevents food debris from blocking the vent. Safety Lid Lock – Will prevent accidental opening of the cooker while it is pressurized and it works as well without electricity. 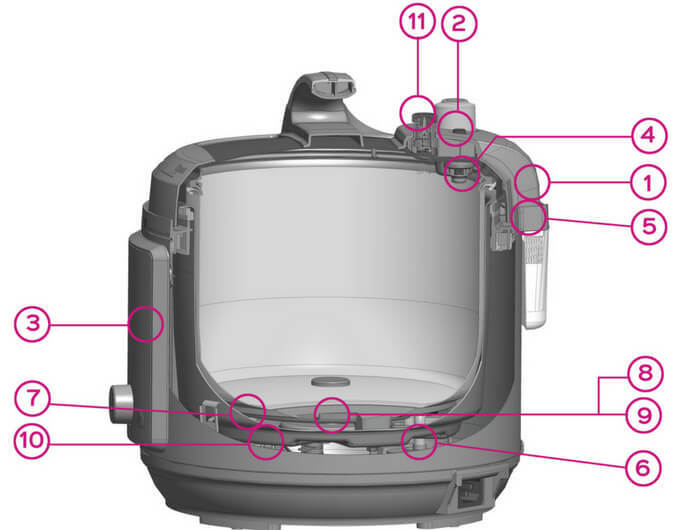 Lid Position Detection– Tracks whether the lid is in an unsafe zone for pressure cooking. Temperature Sensor– Monitor the cooking temperature and will ensure that it remains in a safe range. Burn Protection – High-temperature tracking during heat-up, saute’, keep warm and other programs, preventing the food from burning. Pressure Sensor – Keeping pressure always inside a safe range. Electrical current and temperature fuse – Shuts off the power in case that the current or internal temperature exceeds safety limits. Encapsulated last-resort pressure release – IN any case that the primary pressure regulating valve fail, the excess pressure is released into the body of the unit (between the outer lining and the inner pot). Quick Release Button – Automatically puts the valve in locking position (we talk about this, below). Having in mind that all the other models come with 10 safety systems, the ULTRA comes with one extra the Quick Release Button. That’s basically a mechanism made to reset the steam release to the Sealing position when the lid is closed or opened. So is a great way to get rid of the common error of leaving the vent open during cooking. Is a cool feature having in mind that the offset-button will keep your hand away from touching the pressure valve making the pressure release more secure and less likely to put you in any type of danger. 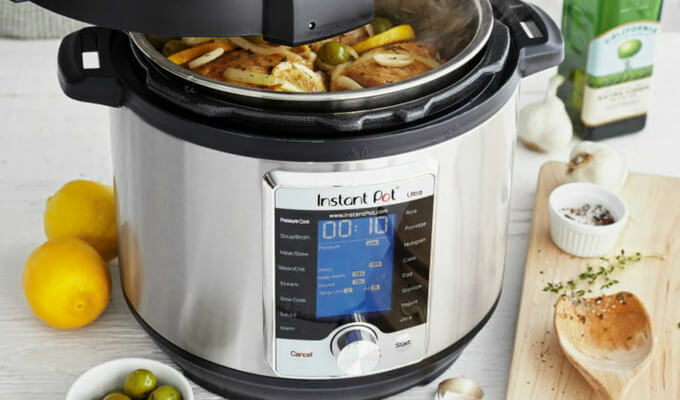 It has all the features that the earlier Instant Pot models offered you plus a large digital display and great management system that makes it really easy to operate and really the ideal thing to cook for if you are looking to cook without worrying about everything. There is a cooking process indicator which serves to show you how much your food has been processed, this makes it easy to keep an eye out on the progress of your meal preparation. Having in mind that this model gives you a lot of versatility, the 10 in 1 model is a great buy for people who are looking at the versatility and flexibility at a good price. 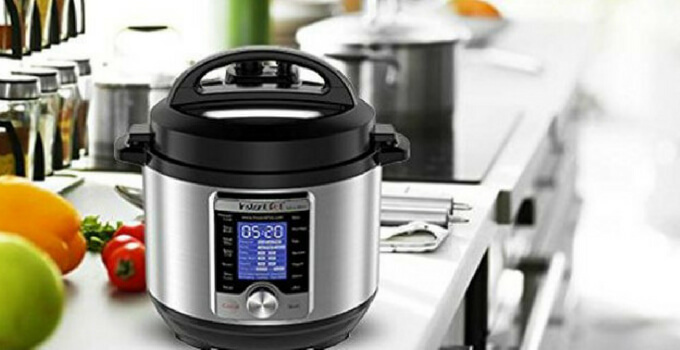 If you have an Instant Pot machine, there is no question of thinking about shifting, since there’s a huge amount of new functionality that comes along if you were thinking of getting a new model, this is the one to go. Finally, this model would also be a great pick for those that are getting their first electronic pressure cooker. 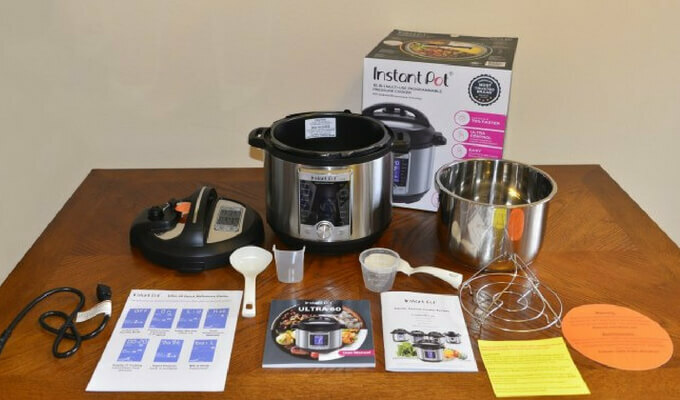 The safety, warranty, and detailed features that come along with the Instant Pot brand combine with the amount of new generation settings that come with this model plus the cool additions such as the drip catcher and the detachable power cord, making this unit a really great model to choose for both the experienced pressure cookers and the beginners as well. The Instant Pot Ultra 6 Qt 10-in-1 Multi-Use Programmable Pressure Cooker is definitely getting a lot of love for the users getting a lot of positive reviews. 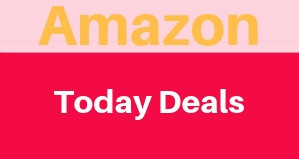 Most of the comment and reviews are about how great is for accomplishing various kitchen tasks at once. One of the only concerns online is about the dial button and knob-like interface that makes adjustments a little bit hectic to figure out. But besides that, this model delivers exactly what it is intended and can achieve all the 10 tasks mentioned. There is no doubt that it is a great appliance that boasts the best features. 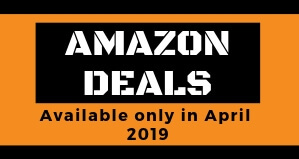 Check prices and read more customer reviews on Amazon now. Instant Pot Ultra 6 Qt 10-in-1 Electric Pressure Cooker is one of the latest Instant Pot Models. 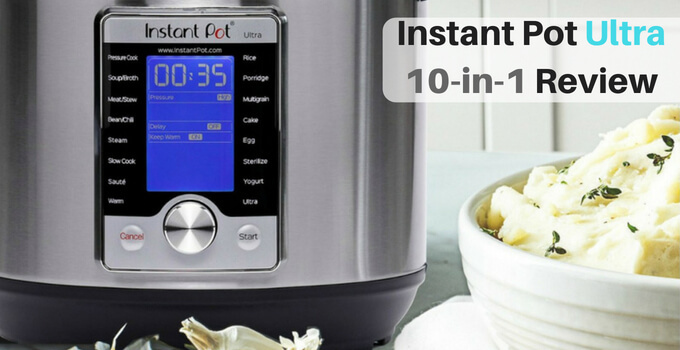 A sleek & geeky addition to the Instant Pot family. Not only is the Instant Pot Ultra super nice looking, it is also one of the most feature-packed & customizable electric pressure cooker the market has ever released! !